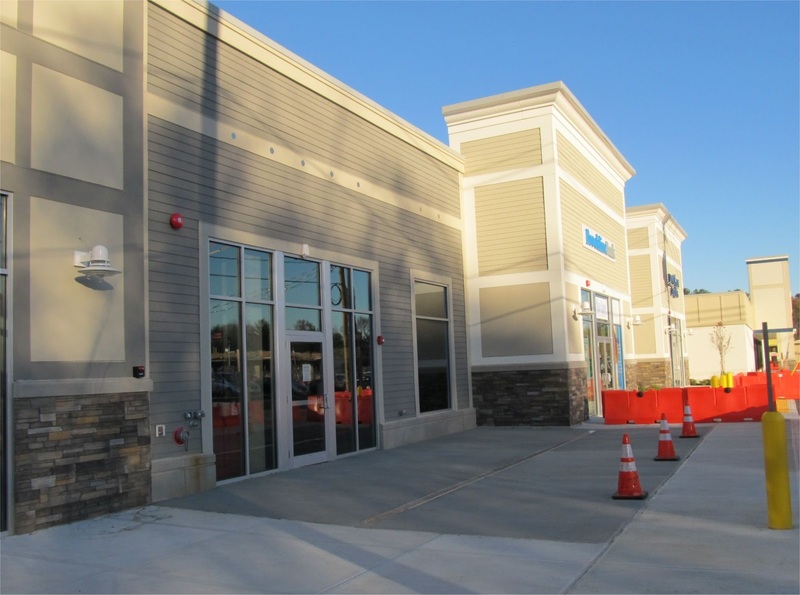 Comella's Restaurant is expected to open at 158H Great Road in the Bedford Marketplace. The restaurant, which focuses on homemade Italian foods, currently has 12 locations in the Boston area including Concord and Arlington. The menu features Salads, Sandwiches, Soups, Pastas, Pizzas, Traditional Italian Entrees and Desserts. 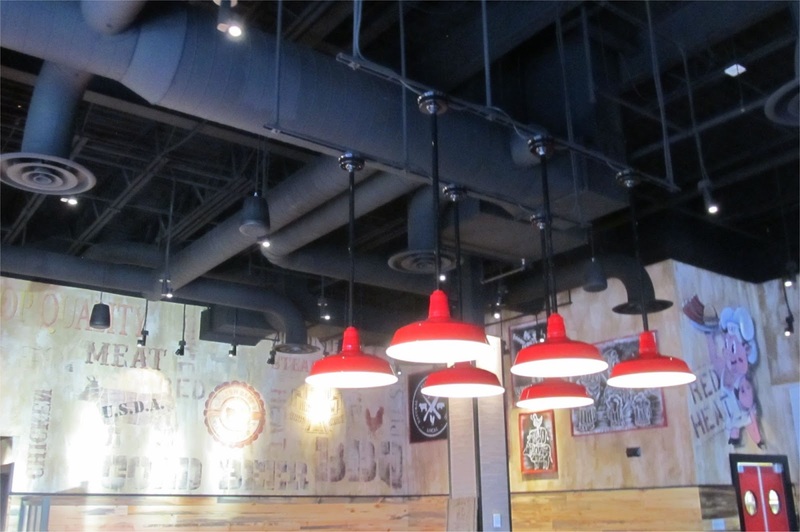 Most locations are fairly small, with less than 20 seats and do a significant amount of take out business as well as corporate catering. Cafe Luigi which has been in Bedford for over 27 years at 168 Great Road, closed on August 29th in order for their existing building to be demolished as part of the renovations at Bedford Marketplace. At the time of their closing they hoped to re-open in the Spring in one of the new buildings currently under construction in the Bedford Marketplace. The parent company of Cafe Luigi also owns Marios in Lexington, Grassfields in Waltham, Jimmys Steer House in Arlington and a few other restaurants. I recently spoke with Cafe Luigi owner Richard Stoico. Richard told me that Cafe Luigi would not be returning to Bedford Marketplace. They are currently looking for a new location in and around Bedford. While they are looking in the surrounding area, they to prefer to remain in Bedford. Scott's Stone Carving Classes at 80 Loomis Street has been offering Stone Carving Classes for the past year or so. I recently got a chance to speak with Scott Cahaly the owner. According to Scott, Stone Carving has it's history in the ancient crafts of Greek and Italian. Scott who is originally from Lexington, graduated from the University of Vermont about 20 years ago. During school he did some stone work on his own. After school, Scott spent about 5 years fine tuning his craft and then began to teach. In 2000, he decided to move back to the Boston area and started working with the DeCordova Sculpture Park and Museum. He spent about 10 years there with a group but then decided to strike out on his own and teach Stone Carving. He first opened a studio in Acton, then moved to Lincoln and then to Fresh Pond which turned out to be a great location. The building was initially empty. It quickly filled up but then the landlord dramatically raised the rent. So he decided to look for a new location for his studio. 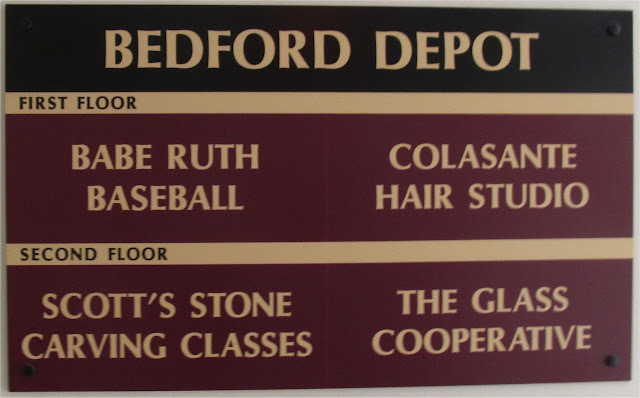 Just over a year ago, Scott saw a Craig's List ad for the Bedford Depot building. He checked out the space and thought it was a good fit to be in an historic building. His lease runs through the end of 2016. 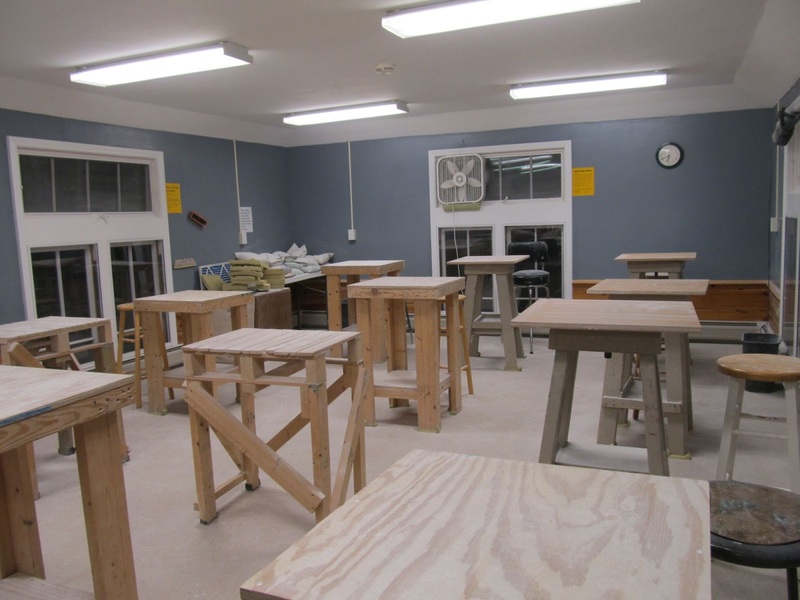 The Studio is located on the second floor of the Depot Building and has room for more than a dozen students. Scott offers two different types of classes. Weekly Classes for people very interested in learning more about stone carving. Scott offers evening classes during the week. These run about 3 hours once per week for 10 weeks. These classes are generally geared for beginners. According to Scott, anyone off the street can learn stone carving. An art background is not needed. The class is open to Adults and kids age 12 or older. Scott teaches the entire process of stone carving from the beginning chisels up to the files and finishing process. One-day Workshops for beginners and more experienced carvers. Scott teaches hand-carving techniques and stone carving lore is demonstrated and discussed. 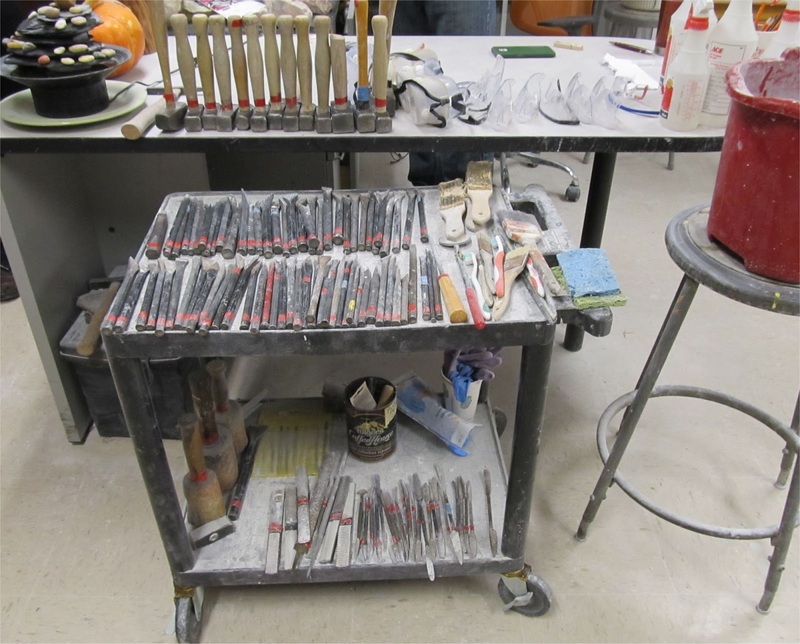 The workshop includes use of the Studio’s tools and a 5-8 pound piece of alabaster. These workshops last about 5.5 hours and are are generally held on the 3rd Saturday every month. A wide assortment of tools await. 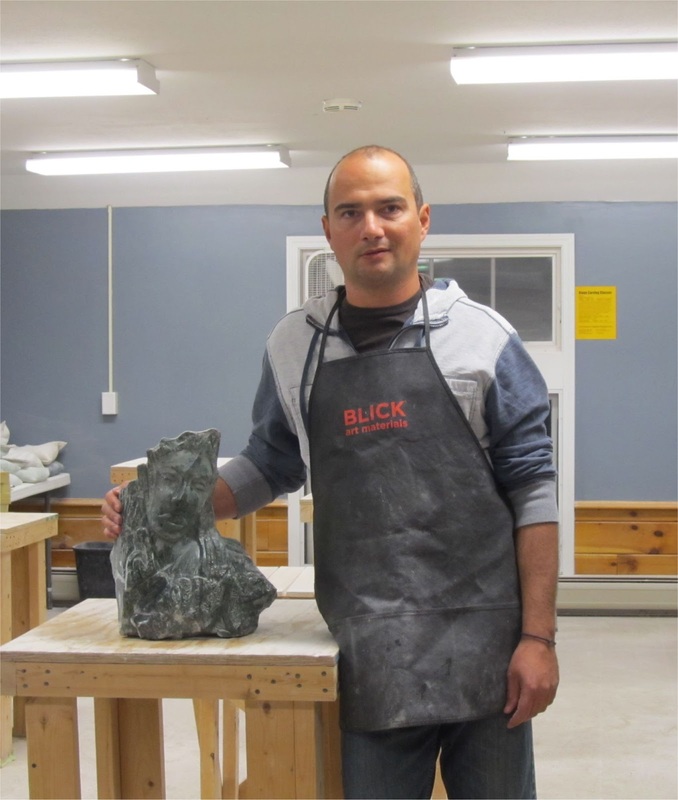 Scott is a member of the New England Sculptors Association. One of the things that Scott really enjoys is watching people get very absorbed in the process. They become very focused and lose track of time, enabling them to to get away from any problems and live in the moment. Scott with one of his current projects. This one is made of Vermont Marble and is becoming a Mayan Princess Guardian. Scott splits his time between teaching at the Depot Park studio and working on his own Stone Carving projects at another studio. While he has done a few commissions, the majority of his own work he thinks up himself and then sells through other Studios and Galleries. 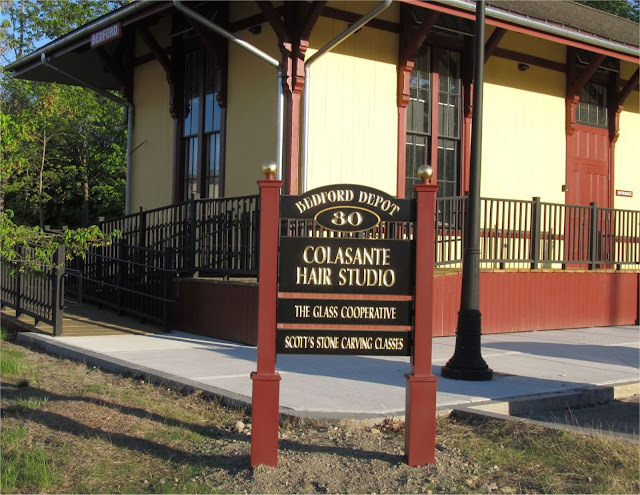 The building is shared with a stained glass studio and other businesses. It's good to see the very beginning of an art scene in the Depot District. Establishment of a Bedford Cultural District and more studio space for artists will help it grow. While many communities have initially embraced so called STEM programs (Science, Technology, Engineering and Math) to help drive innovation, the addition of Art (STEAM) is critical to the success of these programs as Art plays an important role in creativity and problem solving. The finishing touches are being added to the Red Heat Tavern at 150 Great Road in Bedford Marketplace as the restaurant prepares for it's grand opening. As previously reported, the restaurant will open for dinner only starting on Monday November 9th, with a full opening on Monday November 16th. Work on the interior has been completed. The restaurant is awaiting final placement of tables and chairs. There should be about 200 seats inside with up to 46 seats outside. Some work remains on the outdoor patio. With climatological winter less than one month away, I suspect some of this may not be completed until after the restaurant opens. 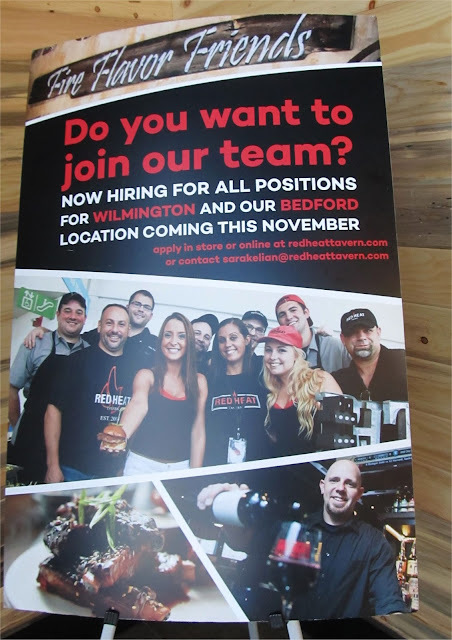 Red Heat is still looking for additional employees. 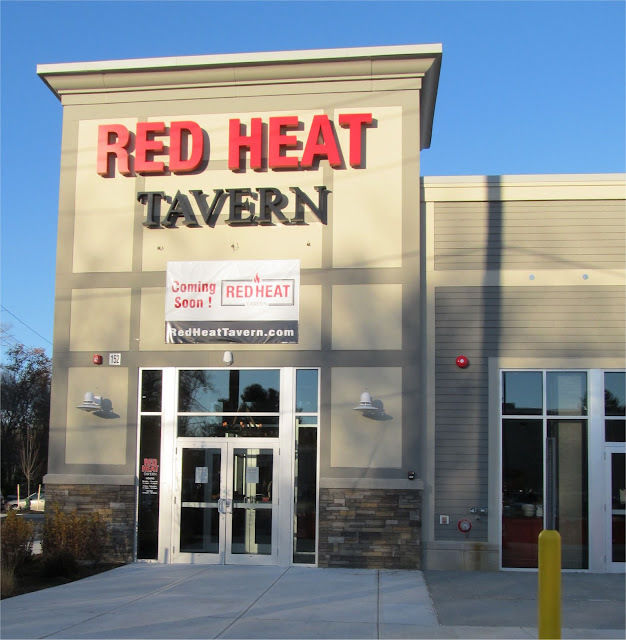 Red Heat Tavern which was already known for being allergy friendly, recently announced it's fall menu and every item on the new menu can be prepared gluten free. While final operating hours have not yet been announced, the restaurant is expected to be open until 11 pm during the week and until 12 am on the weekend. It will be interesting to see how Red Heat Tavern does in Bedford. Based on the initial feedback from town residents I expect it to do well.